Our family secret is the chocolate mousse, a recipe I plan to give you, soon, but not today! Today we will try another mousse, with fruits. It is delicious, easy to make and you can of course change the fruits once you have understood how to proceed! Strawberries, for example. For the kiwi mousse: cut the kiwis in dices and crush them. Mix the sugar and egg yolks, then mix them with the kiwi in a saucepan. Cook for about 3 min, keep stirring. Then, remove from heat. If necessary, mix with a blender. Beat the egg whites until stiff. Add them slowly to the kiwis. Put in the fridge while you prepare the mango. For the mango mousse: peel the mangos and cut into dices. Bring together the sugar and egg yolks, mix with the mango in a blender. Beat the egg whites until stiff and add them. 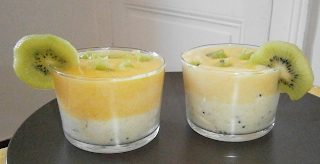 Prepare the verrines: first the kiwi mousse, then the mango mousse. Decorate with fruit dices. Let it rest in the fridge for 5 to 6 hours. A handy trick for your egg whites: it will be easier to beat them if they are very fresh. And how to know if you have beaten long enough? Turn (slowly!) the pot upside down. The eggs are not supposed to move. If they do, keep beating. Great! the recipe is now in english!